This is the third Tool Primer article on finishing your woodworking project. You can find Part One: Sanding here and Part Two: Penetrating Oils here. 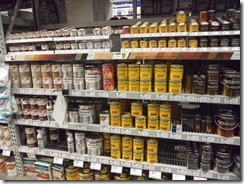 In this article I will discuss the film finishes available for woodworking projects at most local big-box hardware stores. The first step is creating a clean, dust-free uniform surface by sanding all a parts to a high grit. I detailed my process in Part One. The finishing process is the difference between a good woodworking project and a heirloom piece of furniture. When I want to really knock a project out of the park, I focus much of my energy on choosing and creating a proper finish. Film finishes are a class of finishes which cure, or dry, on top of a piece of wood, surrounding the wood in a layer of film. The result is similar to taking a piece of saran wrap and wrapping it all around a piece of wood. Penetrating oils enter the wood and cure inside its cellular structure, while film finishes cure on the surface of the wood. While paints and stains work in the same manner, I will address them in a different post. Film finishes have two parts: the binder and the solvent. 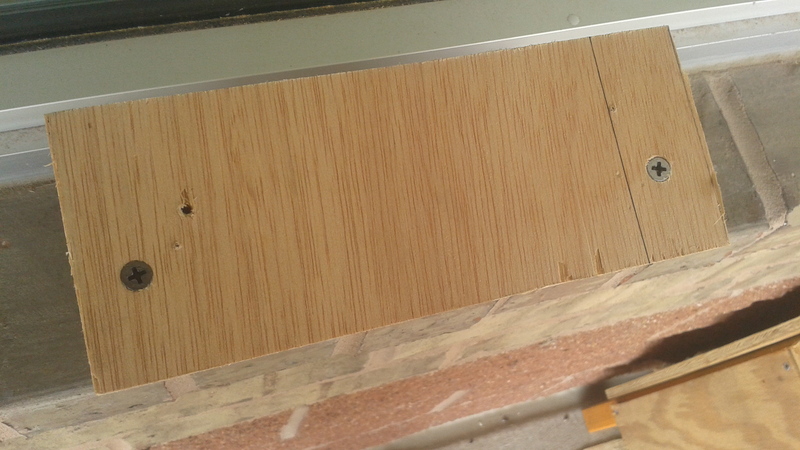 The binder refers to chemical polymer suspended in the finish which cures into the hard film left on the wood. The solvent is the liquid which conveys the binder to the wood. For every binder, there is an appropriate solvent. Finishes with the same solvent can mix, whereas finishes with different solvents must cure completely before a different finish can be applied over them. There are four major film finishes available at your local big box hardware store. The finishes are classified by their binder: polyurethanes, wiping varnishes, lacquer and shellac. Polyurethane is a made from petroleum by-products. The resin is suspended in mineral spirits. Poly cures to low, medium or high glosses depending on the type you buy. 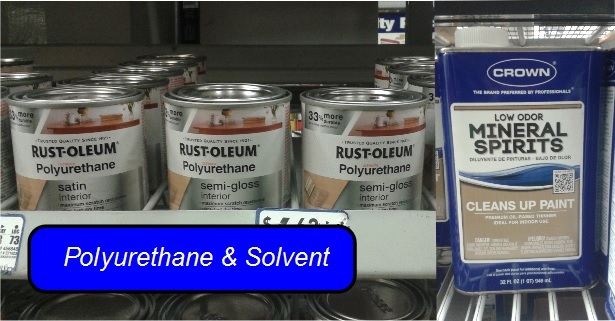 Oil-based polyurethanes impart an orange or amber hue to your work, while water-based polyurethanes often dry clear. Poly is an appropriate finish for tables, chairs or other projects which need a tough, durable coating. Wiping varnishes come in a variety of code-names and brand-names. Two of the most common will be Danish oil and tung oil. Both of these finishes consist of a varnish (such as polyurethane), a penetrating oil (such as BLO) and and some amount of solvent (usually mineral spirits or acetone). While wiping varnishes don’t offer the same protection as polys, they do offer a great mix of protection, durability and ease of application. Most wiping varnishes can be applied with a rag or brush and dry quickly. This allows you to build up coats until you achieve the results you want. Lacquer is a tough, clear finish that can be applied via spray gun, spray can or brush. Lacquer gives similar protection (especially in multiple coats) as polyurethane with quicker drying times. Lacquers are more easily damaged by UV lights. Multiple layers create an “always wet” look to the wood which is gorgeous to look at but feels plastic. 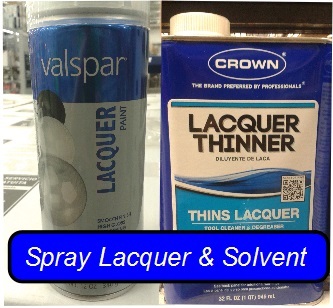 It’s solvent lacquer thinner, is used to thin the finish enough for spray purposes. I use the spray can version for small projects and I have little experience with the spray or brush-on versions. Of all these film finishes, only one finish has an environmentally sustainable source. Shellac comes from the excretions of the female lac bug as she lives out her life on a tree. Which means it’s bug spit. Or poop. I’m really not sure which. I do know this: shellac is an amazing material and wood finish. It can be used as a sanding sealer (a thin coat provides a base for deep, lustrous top coats of another finish), it can be clear or can darken woods, it creates incredible shines when buffed out (check out “French Polishing”) and it provides a reasonable balance between protection, durability and ease of application. Shellac can be applied with a rag or sprayed to achieve some wonderful results. It dries quickly, about thirty minutes depending on temperature. It can be sensitive to humidity – shellac should only be applied when the weather is clear and sunny. If too much water is absorbed in the finishing process, shellac can blush (turns a white chalky color). Fixing a blush requires soaking the piece in alcohol and reapplying the finish during clear weather. Shellac dissolves completely in denatured or ethyl alcohol. 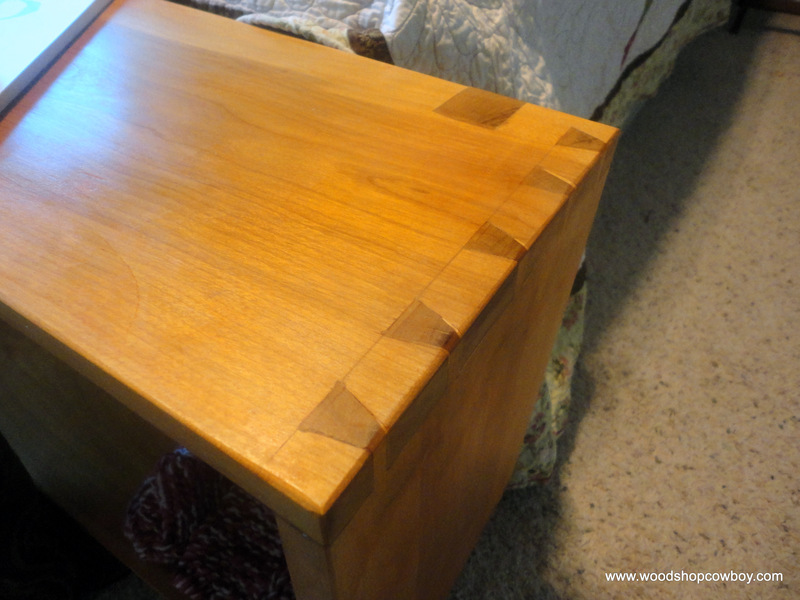 Unlike other finishes, liquid shellac has a limited shelf life – about one year. Old shellac will remain tacky and sticky after thirty minutes. Check the can’s date and use a test piece before applying it to a project. Shellac is a prime candidate for interior furniture finishes. It’s from a sustainable resource and contains low VOC/odor issues. It can be used under any other finish as a sealer. While not as tough as poly, it’s tougher than wiping varnishes and doesn’t feel plastic-y. Here are the various different finishes with results attached. Thin the finish to a ratio of 1 part solvent to 3 parts finish. I use mason jars with graduation markings to rough out my proportions. All wood finishes at the big box store are too thick for easy application with brush, rag or spray gun. So I pour some finish into a pint-sized mason jar and top it off with the solvent. The result is a finish which needs more coats, but applies without brush marks, drips, etc. associated with other finishes. Double check my application process using a finishing reference. And that reference is Bob Flexner’s Finishing 101. Wear gloves. Over the years I’ve developed some mild allergies to the contents of finishes – a case of one too many applications without gloves. I also remove any jewelry from my hands – my rings tend to exacerbate the issue. Test it on a piece of scrap sanded to a comparable grit. Because if you don’t, your finish will be a surprise! I have three go-to finishes for different applications. For anything which will contact food or mouths, I soak the workpiece in mineral oil. 1. A light coat of BLO to darken the wood, if desired. 2. Multiple rag-applied or sprayed coats of shellac. I wet-sand at 600-grit my first and second-to-last coats of shellac. 3. Apply a coat of paste finishing wax with a scrub pad and buff with brown paper bag or cotton rag. For high abuse objects, like table tops or outdoor projects, I brush on multiple coats of thinned polyurethane. I very often sand the first and second to last coats with 600-grit wet sandpaper to achieve a smooth look. Outdoor projects require spar urethane, a more flexible formulation.